We spent some time mulling over many possible headings and came up short, nothing really covered all the nooks and crannies or the scope of geography, and still doesn’t. In our opinion if we were to rank all the headlines we have created, this is as bad as it gets. Then again, everything else was manifestly worse, the problem every potential offering has is as simple as it is monumental. To claim that the entire fabric underpinning conventional explanations accounting for the genesis of modern humanity and their development until around 7,000 years ago is almost totally incorrect, is a huge ask. To try and sum that cardinal error up in a few words is no easier and necessitates a new approach. This time will be different, there will be no cryptic headings and nor will we slowly flesh out our research in incremental steps that eventually culminates in an opinion, new area to consider or an extension on previous findings. The reason we intend to open with our conclusion and dispense with the fanfare and trappings is that this is a genetic path we have been down before and it is no secret that we endorse the Out-of-Australia theory. 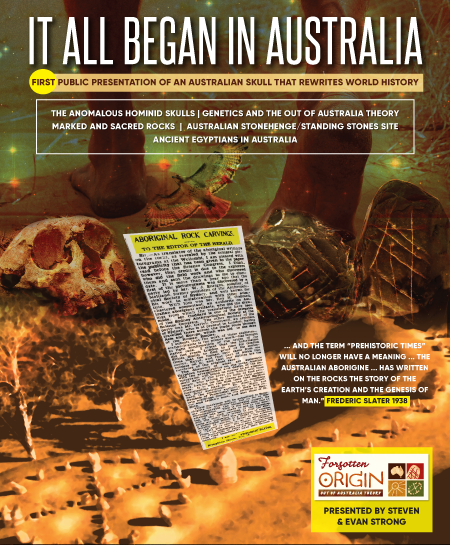 The evidence we have already presented in validating our belief modern humans evolved in Australia is extensive, and it doesn’t end with a few genes being shared near and far. It was from this country art, music, religion, democracy, astronomy, navigation, gender equality and all the nobler pursuits that enlighten, was exported so long ago. Some of the research to be discussed certainly is more of the same, but on this occasion we intend to add a few new contributions then try and establish an overview of the entire Indo-Pacific region. In doing so, we have already initiated proceedings through establishing an Australian foundation as the beginning place. The next step is to investigate nine locations/genetic sources which justify our belief that humanity began in Australia and that this genetic and esoteric seed was exported from Australia as Original mariners sailed throughout the Indo-Pacific Rim. Make no mistake the genetic imprint of the Original people is ancient, but it is not a historic relic and still exists to this day. The exodus of the first Original Homo sapiens sapiens begun hundreds of thousands of years ago and spread to all parts of the Indo-Pacific Rim. The problem is that no matter how strong the evidence supplied through genetics and bones, the very best we will get from official channels is that this is all ancient history, even if it did happen, it is a story is long gone. 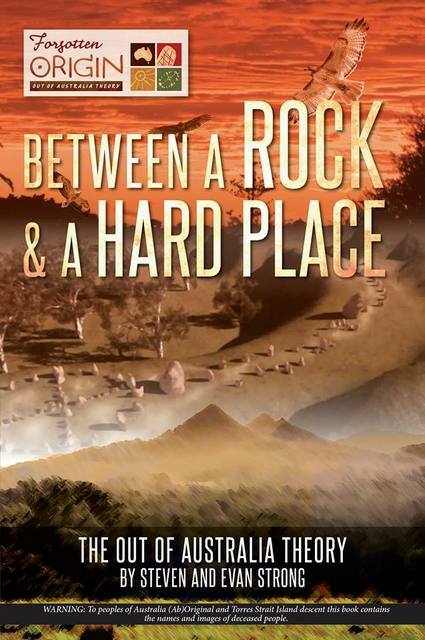 Today’s attitude towards history has a time-line that begins when humans began to gather yet again into concentrated clusters of settlement around 7,000 years ago. Whatever happened earlier, just doesn’t register on the historical radar. Before that historic turning point there is talk of caves and a nomadic lifestyle overlaid with innuendos suggesting a less intelligent hairy clientele. With no building, metropolis or machinery to admire these assumed sins of technological omission have sadly lead to a situation where what happened then is no longer relevant, and somewhat of an embarrassment. Therefore, if the Original people were prominent in ancient world affairs, it merely comes from a less informed and intelligent setting, and fortunately we have moved forward since then. Moreover, if the Original people had sailed to distant locations there should be archaeological proof in print. A simple inspection of any accredited text or academic book will find no entry that supports such a radical proposition. So with no published proof of earlier Original mariners sailing the globe, and if by some remote chance it did occur, having taken place in less cultured and cruder times, either way such an event is of less consequence. Those objections are wrong on so many levels, the most pressing error relates to timing. The critics are assuming that if any contact did take place, the genetic evidence is long gone and view any associated mathematics beginning with four noughts and more. We disagree, and are absolutely confident there is enough science wrapped around one nought found within our personal time-line without needing to look further back. 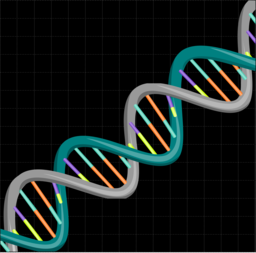 In maintaining our decision to reverse parameters and sequence, we will now begin our personal Original time-line with the most recent area of genetic ‘research,’ or perhaps surrender might be a more appropriate description. Past that point we will travel further down an Original road that runs well into five noughts and possibly more, but we do not need one nought in reply, as all entrants came to our attention over the past nine years. This may surprise many, but the truth of the matter is that there is a bounty of rigorous science which has identified solid connections through Original mitochondrial DNA, Y Chromosomes, historical records and cranial measurements to people who were, or still are, living in North America, South America, Mongolia, Siberia, Japan, Malaysia, Andaman Islands and India. Finally after two decades of denial or obfuscation to an increasing influx of scientific papers and discoveries that run counter to prevailing theories of human evolution, one of the most influential proponents of the current explanation of modern humanity evolving in Africa between 150-200,000 years ago, has publicly conceded that this date and place has been proven to be manifestly false. 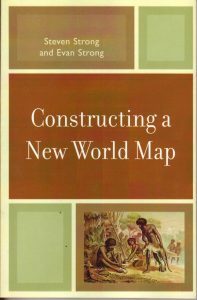 What Stringer did not know when admitting mainstream science had completely misunderstood how and when modern humans evolved, is that more recent archaeology found in Spain has only extended the seminal date when homo sapiens sapiens became a separate hominid strand. The researchers in Spain have genetically identified relatives “to early Neandertals” (4) which has been dated at 430,000 years old. Because of this sensational date they were forced to concede that the early divergence of hominid strands occurred 550,000 to 750,000 years ago. 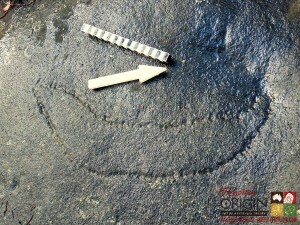 (5) This is an extension on Stringer’s recalibration in timing of up to 250,000 years on the assumed maximum date, and we have no doubt further research will see that date continue to increase. With the white flag waving now is the time to begin this new debate, and Australia will be the pivotal talking point when relocating where. 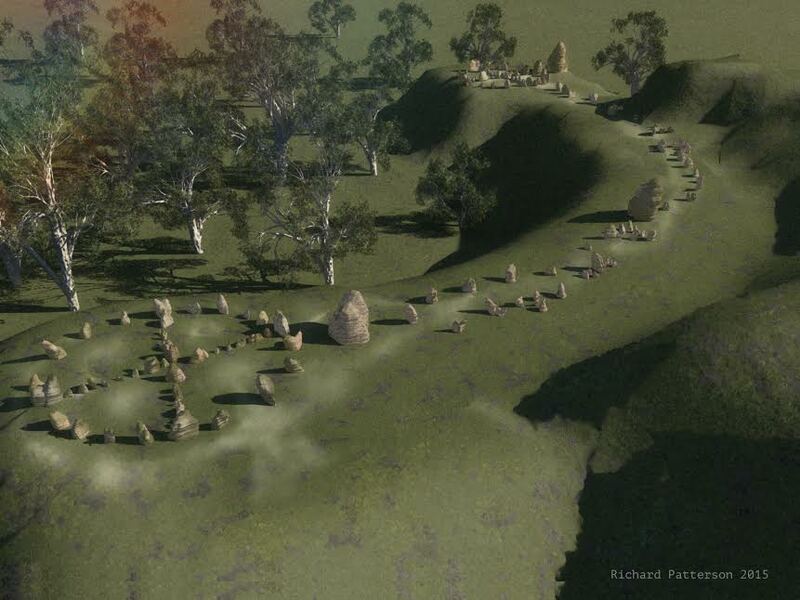 Highly respected archaeologist, Jim Bowler, along with a host of mainstream experts, will assure any that ask that sometime between 50-60,000 years ago modern humans who sailed from Africa stepped ashore somewhere at the Top End, then slowly spread along the northern coast line of Australia. Understandably referred to as island hoppers and sailors, according to the accepted version of events, this was the very first time boats sailed across oceans to new continents. These strangers from Africa slowly inched along the coastline, if for no other reason than the flora and fauna inland was so foreign, while the resources from the shore and in the ocean was simply more of the same and required skills they already possessed. It took close to 20,000 years to reach the southern extremes of the continent, and once the entire coast was settled movement up major river courses was the next stage of settlement, and was then followed by some more adventurous souls moving the drier locations. Under these agreed conditions of settlement, it has always been assumed that humans first reached Tasmania and Victoria about 40,000 years ago. That was Jim Bowler’s expectation and time-line, as it was all proponents of the mainstream understanding of ancient history, but all of this is yesterday’s news and no longer makes any sense. We have no doubt Bowler is still locked into a permanent state of inertia verging on denial as he tries to come to grips with the results of his investigation replete with dating techniques and methods he personally endorsed. Despite Bowler’s expectations material taken from a midden from Point Ritchie was reliably dated to be 80,000 to 90,000 years old. Despite the impeccable science Bowler still has reservations in regard to the disturbing timing and wants more. He advised caution as the date is so outside comfort zones and felt once another discovery with six figures is confirmed he would be more predisposed to agree. What is a touch puzzling is that Bowler, along with Gurdup Singh and Peter Ouwendyke, presented a joint paper on their work on a core sample taken at the Great Barrier Reef in 1983 which they proposed dated human activity through fire-stick farming back to 186,000 years. Obviously an oversight or another example of selective amnesia, the reality of the science at hand is that Bowler has no choice but to accept the credentials of his own work, then grapple with either a new minimum African entry date of no less than 100,000 years, or that there was never an entry date, only a time of first exit from Australia. For quite some time we have been aware of an intimate connection between the ancient Ainu people of Japan and Australia. 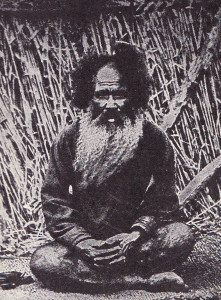 Close to seven years ago we purchased two 1922 copies of a book written by the eminent German anthropologist who introduced the concept of on-site field studies to the European academic community, Dr. Hermann Klaatsch, and in it is a photograph taken in 1894 of a male Ainu Elder. Klaatsch was adamant, as we are, that this Elder has all the facial features, hair, physique and genes of an Original person. He also was convinced humanity began in Australia and that it was from Australia the first humans set off to other countries. So amazingly close was this person photographed in every aspect when compared to the Original people, at one presentation we offered $100 for anyone who could correctly nominate to within 100 kilometres the place this photo was taken. The choices were numerous and spread across the entire continent of Australia and Papua New Guinea, but not one vote was cast outside Sahul (Australia and PNG), and thankfully the money stayed where it was most needed. Klaatsch was even more expansive in identifying many Caucasian and Asian groups, including the Malays and Mongoloids, with ancient genetic links to the Original people. In his estimation “we have not yet sufficient evidence to determine the position of the Malays and Mongoloids,” (6) nevertheless, despite that void he felt “it is probable, at least, that they represent a side-branch of the Austral-Caucasians.” (7) He felt that “the prominence of the cheek bones (which begins in the primitive Australian type)” (8) along with “the proportions of the limbs” (9) were Original traits that spread throughout Asia. Since that proposal there has been an abundance of confirming evidence. The oldest Homo sapiens sapiens yet found in Asia was found at Perak Cave, Malaysia and is dated at a little over 10,000 years and is agreed to have the physical features of an Original man, and has not been classified as Asian. If Eve did by some remote chance live in Africa, then she had been involved in a long-distance relationship between continents, because Adam never walked one step in or near Africa. A recent and extensive study of the Y Chromosomes of males throughout the planet, of which the main focus was to test the validity of the Out-of-Africa theory, was unequivocal in determining that there is no African genetic input in the genesis of any male lineage outside Africa. The brief of the Russian researchers was ambitious to say the least. Through the collection and comparison of a large number of Y Chromosomes, they hoped to identify the common genetic male father who sired the first modern human with his partner ‘Eve.’ In doing so they hoped to test the credentials of the Out-of-Africa theory, of which they made clear in their introductory remarks, has recently been challenged and its credentials were rightly called into question. The important point was this exclusion clause includes “all non-African groups,” (19) and can only be read as a declaration that Adam cannot be African. No surprise there, Paul Stringer’s report on the mtDNA of an earlier Neanderthal has already moved Eve further back on the time-line and given her the license to conceive anywhere on the planet. All this does is confirm that the father is not African, and Eve is a citizen of somewhere on this planet. This quite sensational genetic connection was a blessing on both a personal and international level. What was discovered led to my wife, unbeknown to me, arranging a genetic test which would eventually confirm my direct Original ancestry. Equally, although the degrees of separation are many, the same can be said for every Homo sapiens sapiens, past and present. At the turn of this century the proper noun Denisovan did not exist. Fifteen years later it is commonly accepted that outside the Neanderthals, they were the most widespread and numerous of the many non-sapien strands of hominids. First discovered just over a decade ago in Siberia, until some mtDNA was extracted from the finger of a female Denisovan thought to be about 30,000 years old, it was first regarded as an interesting off-shoot, but thought to have no direct relevance to modern humans. The genetic analysis of this woman’s genetic make-up was totally unexpected, it now seems every human of today has a percentage of their DNA that directly matches. And in some cases, well one in particular, the identical genetic cross-over is not insignificant and has no earthly parallel. The Original people of Australia have between a 4-6% match to the Denisovan gene (mine is 4.7%). Whether comparing to the Neanderthal input or any other extinct hominid group the highest levels sit at just over 2%, up to three times that score is phenomenal. Surely the mere thought that one twentieth of my mtDNA is not sapien but Denisovan, as are all Original people, warrants serious investigation. The associated contradiction this causes is exacerbated by the very recent discovery of Denisovans in Spain in residence around 500,000 years ago. It was difficult enough trying to explain an undeniable genetic link to the Denisovans, who were in Siberia nearly 100,000 years ago, but to multiply the timing by five and re-position the same genetic stock thousands of kilometres to the west, complicates matters. How can the Original people, who are supposed to come into existence fifty to sixty thousand years ago in an isolated southern continent, be so closely and intimately related to hominids that are at least 500,000 years old? The numbers do not add up and common sense is the first casualty of this equation. Logic demands that since every endorsed account of Original settlement insists that once reaching Australia the African Homo sapiens sapiens remained isolated, and it is universally agreed that the Denisovans never reached Australia, therefore, someone moved/sailed camp. Since the experts stand united in insisting that the sailing of ocean-going boats across the seas is the province of Homo sapiens sapiens, then what option do we have in filling this vacuum, other than suggesting the Original Homo sapiens sapiens mariners were solely responsible? A few years ago we had the privilege of meeting a charming gentleman who was (and hopefully still is) the Chilean Ambassador to Australia. What immediately struck us was how progressive and spiritual this person is and in particular, his account of how one controversial subject is addressed and taught in every Chilean classroom. At every school in Chile when the children study their origins and ancient history, all are taught of a theory that espouses an Australian presence in Chile and throughout South America taking place tens of thousands of years ago. It is suggested that the Original mariners basically ‘hitched’ a ride on the ‘Roaring Forties.’ Under favourable conditions the children in Chilean classes are assured it would take less than a month to complete the first part of the journey and step upon the American continent. In what is an unexpected recent addition to this cross-continental contact, we have been reliably informed that according to a Mayan shaman the return journey from America to Australia was through the assistance of ocean currents, not the wind. Often Elders and mystics from America would make their way to Australia as pilgrims seeking tuition in the esoteric. The boat they occupied was completely sealed, without rudder or sails and left entirely to the timing and ocean currents. They took maize for food and as the boat was watertight and unsinkable, as long as the currents behaved as they had done so for millennia, the expectation was to make landfall somewhere near present-day Sydney. It may be a coincidence, but we sincerely doubt it, that close to Gosford on a rock platform situated less than two hundred metres from the sea, there is a pecking of a boat with a high stern and bow needed to negotiate open seas and large waves. What was always of interest is what is missing, there is no sail, mast, upper cabin, rudder or any form of steering device. This all fits in perfectly with the clear evidence through Original genetics and cranium measurements found throughout America and is a topic and geography of immense importance we will be examining soon in our time-line. 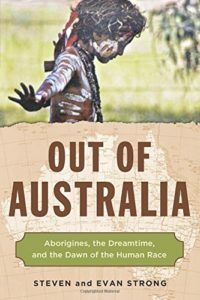 But before focusing on the Original presence in America, India has an unexpected genetic relationship to ancient Australia that has regrettably received virtually no publicity or media coverage in the mainstream Australian press. This research of mtDNA conducted in Southern India was part of a national survey and was headed by Dr. Rao. 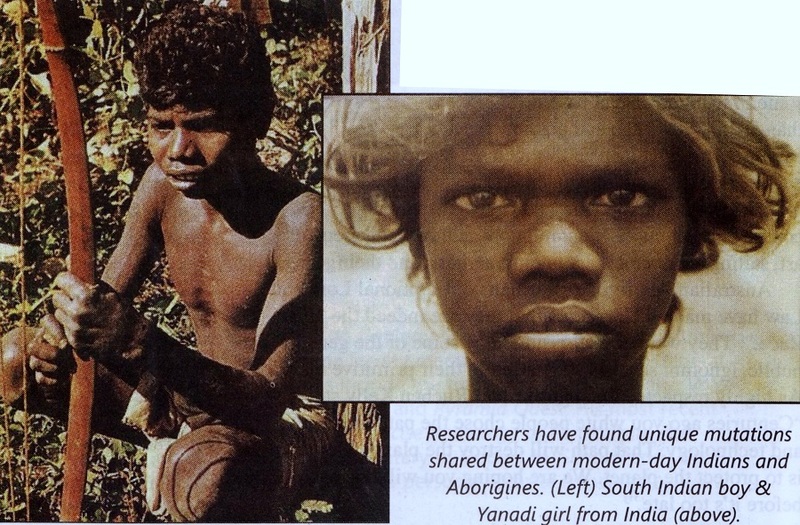 Nine hundred and twenty-six individual blood samples were taken from a variety of people, some of whom are regarded as a relic of the past and are often referred to as ‘bush people.’ What was the cause of considerable consternation was the presence of seven samples that exhibited distinct Australian Aboriginal genetic signatures. What was signed, sealed and delivered was absolute proof that at some stage in the distant past the people from India and Australia met face to face. There are no guarantees on location or initiator of contact, either Australia or India are equally possible as any genetic analysis gives no definitive geography, but they did meet. In deciding which people were the more likely responsible, knowing that Original genes and bones are scattered over the entire Indo-Pacific Rim certainly strengthens the Original credentials. When discussing this genetic science with an Original man of high education of both Black-fella and White-fella teachings, he shared with me an incident that took place when he was India. For reasons I can no longer remember, he needed to make his way deep into the forest of Southern India seeking time out from the noise and bustle of daily life, well away from any sign of civilisation. Now alone, he felt the need to make a private offering to nature and sing a secret sacred song he learnt from his father, who was from one of the desert tribes in the middle of Australia. Not long after he began to sing this ancient song, the forest joined in. From all around he could hear the same words being sung in the correct order. Then the ‘bush men and women’ stepped out into the clearing and they stood as one in completing a sacred song that knows no boundaries, yet shares the same ancient Motherland. Now with the rest of the Indo-Pacific Basin secure in Original input, it is now time to examine the continent of highest priority which contains the greatest quantity and quality of ancient Original connections. 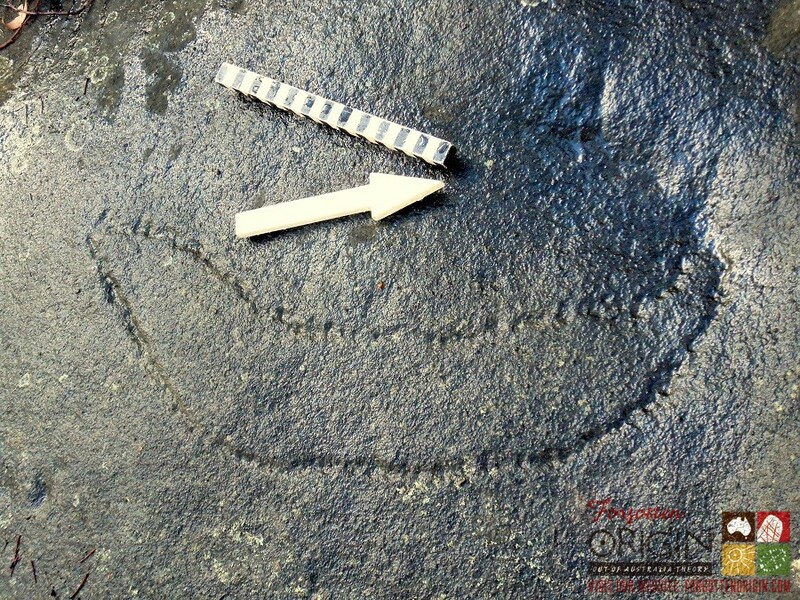 This topic has already been extensively covered in our previous books, with particular attention being paid to Lake Valsequillo, but it seems the flow of Original evidence in America just doesn’t stop. A very recent genetic comparative study of some isolated Indigenous tribes found deep in the Amazonian jungle was meant to resolve questions about their closest connection and kin within the American continent. Being so remote and insular the genetic pool the Tupu and Ge-speaking tribes were considered to be as close as untouched as could be found. The expectation was that the results would give some real clues as to who were the ancient ancestors of American people. The only certainty their paper can testify to is that Original people and genes were in America at a time with five figures. Dr. Walter Neves has 55 Original skulls found in Brazil and quite a few are at least 10,000 years old, and some much older. Outside sailing across the ocean the only other means of transportation is swimming in the water or walking on, and if proven to have sailed to America, all the points on the way are equally accessible. For any predisposed towards assuming that this genetic relationship is a bizarre mutation restricted to an isolated section of the Amazonian rainforest we suggest they hold judgment. Original genes were spread throughout the continent of America. Then something happened, because as of today outside these tribal people in Brazil, the remainder are gone. Some commentators, often with an agenda, claim that the first settlers, the Australian Original people, were wiped out in conflict by the much larger influx of Asians crossing the Bering Strait about 12,000 years ago. They are mistaken four times over, we suspect the gradual demise of the Original people is more a matter of generations of stagnation and separation, than warfare. The real truth is that the tribal people of the Amazon still living in the forest are the last surviving edition of an ancient Original narrative in America. Step 9: The Pericu-(This came to our attention five years ago.) 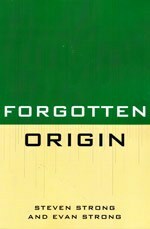 This extract was taken from our earlier book Forgotten Origin. “Several dozen Pericu skulls,”(27) which are normally stored at the “Regional Museum of La Paz in Baja California Sur in Mexico and the National Museum of Anthropology and History in Mexico City,”(28) were recently allowed to be examined in detail. These people are now extinct, but their combined demise was quite recent and they were still thriving when the Spanish invaded their lands. Their written accounts depicted a nomadic society of sea-faring people coping extremely well and showed no signs of stress or oppression from neighbouring tribes. The Pericu exhibited an aversion towards any activity that necessitated leaving the earth upturned and exposed, and left “no trace of agricultural practises.”(32) In keeping with traditions of the Dreaming the hierarchy and positions of leadership was not discriminated through gender, and control “went mostly to males but occasionally positions of leadership were also held by women.”(33) Their religious practises appear to resonate to the precepts ordained by the Dreaming. The Pericu religion “was a basically shamanistic system,”(34) with unique burial rituals requiring the application of liberal servings of red ochre and a method of disposal claimed to create corpses resembling “mummies.”(35) The men, who “normally went naked,”(36) hunted with the assistance of woomeras to propel their wooden spears, which the Spanish referred to as “atlatls (spear throwers).”(37) The observations and details supplied by the Spanish virtually echo the commentaries made by the British when they began to confiscate Australian Aboriginal tribal lands. Step 10: Up and Down the South American Coast-(This came to our attention five years ago.) 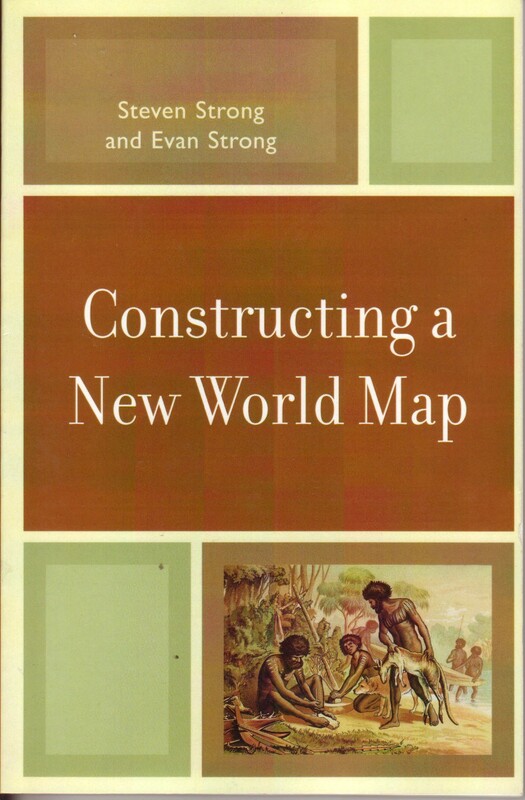 This extract was taken from our earlier book, Constructing a New World Map. We are not swayed by these proposals. Genocide implies that the complete and systematic eradication of an entire race occurred throughout the continent. The continuing presence of the Uro people at Lake Titicaca until very recent times (early 1900) and the continued existence of the Amazonian tribes dismisses the notion of an enforced extinction. 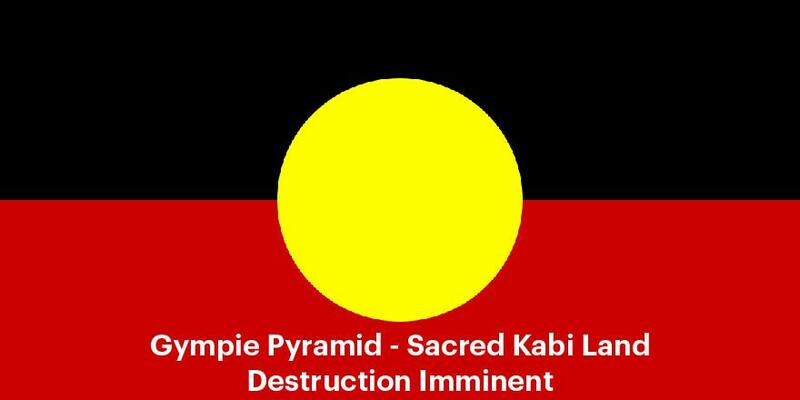 They were portrayed with exactly the same descriptors as those attributed to the Australian Originals by their invaders. Those in control, the media and even Charles Darwin were responsible for creating an intolerant atmosphere. The Original race of Australia was conveniently transformed into “monkeys,” (53) “black animals,” (54) “filthy” (55) and unworthy of ownership. The dialects of the Original language were most assuredly described by some as a guttural tongue, which is undeniably one of the most difficult language groups to master. Archaeologists and commentators sympathetic to Ponte’s point of view were certainly not originally seeking an answer of this complexity. Gonzales finds the outcome unpalatable and, according to Professor Clive Gamble of Southampton University, these discoveries will necessitate creating “a completely new map of the world and how we peopled it.” (57) The tone of all reports makes it clear the outcomes were not matched by anyone’s original expectations and many are still unsure of the ramifications, yet are obligated to report this. Way back when we first began to look at America and the steady trickle of intriguing archaeology, we were already aware of the enigmatic Indigenous people of Tierra del Fuego and their apparent disconnect from the tribal people of the rest of the continent. Cardich is but one of many academics who feel there is a widespread Original imprint in this area, it is agreed amongst scholars there are marked physical and cultural differences, but when addressing causes there is no consensus. 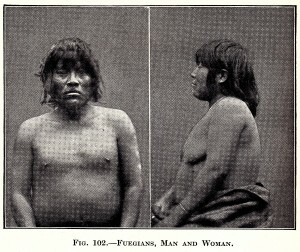 Dr. Hermann Klaatsch felt that the distinctive facial features and physique of the Indigenous people from southern tip of South America was due to the influence of Original genes. Remaining consistent to his belief that most strands of modern humans are Original, Klaatsch feels even though humanity’s base is Australia, the Original people did not progress intellectually and stagnated in their primitive ways and ignorance. It seems Klaatsch has no more respect for the Original cousins, dismissing them as being of the same stock and lacking in redeeming features. “The question is still full of puzzles, especially as regards the Yahgans of Tierra del Fuego, whose very primitive physical and cultural features remind us of the lowest known races of the Old World.” (58) We have learnt that whenever Klaatsch refers to what he believes to be the lowest or most primitive race in his book, that is ‘Klaatsch-speak’ for the Australian Original people. Ignoring the rampant racism, the photographs Klaatsch took show people with a wide face, thick bones and noses that look decidedly Original, and are definitely not Asian. Nor are the contradictions limited to facial features. The people from the southern extremes are renowned for their robust physique and very tall stature, which again is not typical of the Asian race, but very much ‘par for the course’ for the people of Tierra del Fuego. Their phenomenal size of these people has been known and pondered over for over five hundred years. “Patagonian giants were being witnessed on the southern tip of South America … As he recounted in his diaries, Sir Francis Drake made contact with Patagonian giants in 1578.” (59) A height of over seven-foot was not out of the ordinary for these people, but certainly would be if the genetic make-up of the Patagonian giants had any relationship to the Asian race. So, in total, we have some photographs of massive individuals at the southern extremes displaying an Original physique and face, in the Amazonian jungle there are isolated tribes that still retain part of the Original genetic pattern and on a lake, stationed on a floating mat of reeds that the next wave of immigrants refuse to walk on, the full-descent Uro were still alive a hundred years ago. Maybe two centuries before the last Uro male passed on, the last of the Pericu fell. Together these four groups are separated by thousands of kilometres, and in three cases it would seem their fate was in no small part due to being stationed in genetic cul-de-sacs. Each group became extinct because their numbers were too low and the other peoples who still had Original genes were too far apart from each other to overcome this genetic stalemate. The Brazilian connection remains to this day because they retained viable numbers that protected their ancient Original lineage. As a confederation, even though speaking two languages, they have kept their numbers sufficiently high so that both marriages lines and totems are intact. Over recent times the numbers of the other three groups continued to dwindle and with no prospect of fresh Original genes to revitalise their genetic integrity, the last three hundred years saw three more Original tribes of ancient days vanish. To an extent all of the drama and parting of the ways begins with a scientific paper published twenty-five years ago by Professor Allan Wilson and Rebecca Cann titled, “The Recent African Genesis of Humans.” It was as much an academic paper about the theory of the genesis of humanity beginning in Africa as it was a pedestal from which to proclaim victory and rub noses into the dirt of the vanquished. What is revealing is that the word won is the only word in the joint paper that is deliberately highlighted with sloped italics. Being the pivotal part of the introductory sentence in the first paragraph, it is very apparent that the bickering and animosity it caused is a major issue. In the second paragraph, with the pecking order established and the errant players banished to the ‘naughty corner,’ Wilson and Cann expand upon the details and reasons why they and their colleagues now rule the roost. Setting aside Adam’s off-Africa residence which is two decades away, the researchers stated that “all humans today can be traced along maternal lines of descent to a woman who lived about 200,000 years ago.” (62) As we now know that timing can be doubled and no longer applies, but was is interesting is that the next finding was never absolute, it is simply a possible location. They deduced that this woman was living “probably in Africa.” (63) There was never definitely, or a 99% guarantee, the best they could assemble was that it was “probably” (64) African. That qualifier, as it turned out, was fortunate, because before the beginning of the last decade of the twentieth century both Cann and Wilson had recanted and were certain that it was in Australia, not Africa, humanity came into existence. The reason is simple, both of them had not personally examined Original blood and relied on genetic assumptions they found were false. Their paper and the ‘molecular clock’ they posted was reliant upon two assumptions that pertained only to the Original race: that their mtDNA is the youngest and least diverse (one-third that of the African mtDNA) and a belief that Australia was uninhabited until settled by Africans 50-60,000 years ago. They were wrong on both counts and had the integrity to admit that mistake and tidy up the bad research and errors made. Cann was the first to see the error of their ways and in a sampling of the blood of “112 humans, including twelve Australian Aborigines (sic), all from Western Australia.” (65) She found that “mitochondrial DNA puts the origin of Homo sapiens much further back and indicates that the Australian Aborigines (sic) arose 400,000 years ago from two distinct lineages, far earlier than any other racial group.” (66) Quite simply the Australia mtDNA “has a much higher number of mutations than any other racial group,” (67) while their original paper assumed the exact opposite was the case. So concerned was the senior partner of this paper, Alan Wilson came to Australia twice in the mid-80’s and in total collected 31 blood samples from full-descent Original men and women. Wilson found Cann was definitely right, the amount of genetic variation and associated antiquity was without parallel. When both studies were put together they found “that the Australians split off from the common ancestor about 400,000 years ago. By the same theory, the Mongoloids originated about 100,000 years ago, and the Negroid and Caucasian groups about 40,000 years ago.” (68) In Wilson and Cann’s joint paper their molecular clock’s timing is dependent upon the African genes being three times more complex and older. The reality is that the Original genes are ten times older which means they miscalculated by a factor of thirty. So Eve is not African according Wilson and Cann, a date of genesis of no less than 400,000 years is proposed by Stringer, Wilson, Cann and what is another fascinating diversion, Slater also referred to the same date. There is also no doubt the Original mtDNA is the oldest and predates anything African by a considerable amount. An investigation of the mtDNA of a huge collection of over 600 vials of blood taken from full-descent Original men and women was conducted by Roy Simmons (Commonwealth Serum Laboratory), and he found no link between African and Australian genes and that the Original mtDNA is much older than the African gene. The Russian researchers of Y Chromosomes are adamant that Adam is not African, which is merely the male version of the same female story. What has to be understood is that in combination all of these genetic studies cannot supply latitude and longitude, but it can give certainty in one exclusion, in that there is one continent where humanity did not evolve. All of this adds up to one absolute minus, Africa, and a possible plus, Australia. We didn’t need one nought to sort this out, it took us less than ten years to assemble a big picture overview. America is ticked off, it is full of Original genes, bones and ancient myths. 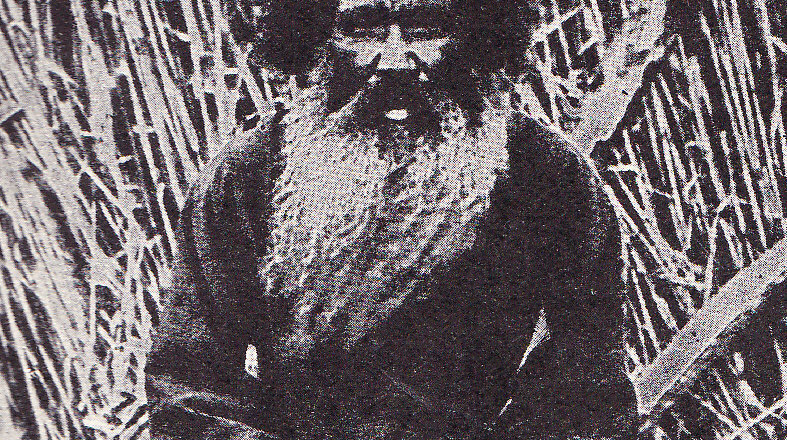 The geneticists are equally convinced, as was Dr Hermann Klaatsch over one hundred years earlier, that the Ainu are half-Original. In Siberia a hominid (Denisovan) is at least 30,000 years old and bears genetic evidence that their race and Original people were in intimate contact in every conceivable sense of the word. With the top end of Asia and all of America accounted for, we can now move closer to home base and still maintain the same Original connection in Malaysia, India and the Andaman Islands. From each location and population everything goes back home to the beginning place, Australia. Six separate locations outside Australia have an identified connection to Original genes and bones. These are not rumours nor supposition but incontestable facts drawn from scientific papers. How they are dealt with is the only issue unresolved, but before doing so let the debate commence after one compulsory rule of engagement is accepted as fact. In prosecuting our case let it be known that we only have to validate one step out of twelve on our receding time-line to win the debate. If just one example of Original presence outside Australia is substantiated then the genetic door is open, as a boat did set sail and Original genes have become part of the heritage of whatever people or location is awarded the official stamp of approval. Moreover, once setting sail successfully why stop at one place when everywhere is reachable? For our critics to prevail in this debate Chris Stringer reluctantly admits must take place, all twelve steps have to be fully discredited for the Out-of-Africa theory to remain on its pedestal. The awkward part of that hypothetical debate is that if Stringer was asked to adjudicate, he would have to decline and declare his bias towards the anti-Out-of-Africa camp. Since it was his paper and speech that openly challenged the accepted date and place in such unequivocal terms, Stringer must remain consistent to his own research and cast his vote against Africa and look elsewhere for an alternative. Can we suggest to Stringer that in seeking a new set of global parameters he should first consult the Original Custodians of what is agreed to be the oldest culture in the world. A few words of guidance and context from a spokesperson of the First Day will provide the clarity in direction that is now lost in the genetic haze. (1) Ann Gibbons, 2015. “DNA from Neandertal relative may shake up human family tree”, ScienceMag, 11th Sept. 2015. http://www.sciencemag.org/news/2015/09/dna-neandertal-relative-may-shake-human-family-tree. (6) Hermann Klaatsch, The Evolution and Progress of Mankind, ed. Adolf Heilborn and Joseph McCabe (Translator) (New York: Frederick A. Stokes Company Publishers, 1923). 284. (12) Klyosov, Anatole A., and Igor L. Rozhanskii. “Re-Examining the “out of Africa” Theory and the Origin of Europeoids (Caucasoids) in Light of DNA Genealogy.” Advances in Anthropology 2, no. 2 (2012): 80. (20) Harvard Medical School. “Genetic studies link indigenous peoples in the Amazon and Australasia.” ScienceDaily. ScienceDaily, 21 July 2015. https://www.sciencedaily.com/releases/2015/07/150721134827.htm. (24) George Weber, “Pericu People (Baja California Sur, Mexico),” 54. 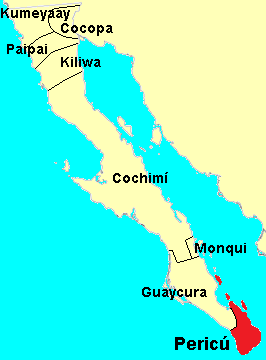 Possible Relatives in the Americas(2007), http://www.andaman.org/BOOK/chapter54/text-Pericu/text-Pericu.htm. (30) David Epstein, “28: First Americans May Have Come from Australia,” Human Orgins/ Human Evolution January(2 January 2005), http://discovermagazine.com/2005/jan/first-americans-from-australia. (38) “The First Americans: Were they Australians?”, Mammoth Trumpet, vol. 16, no. 2, March 2001, http://www.centrefirstamericans.com/mt.php?a=34. (43) Lowell Ponte, “Politically Incorrect Genocide, Part One”, FrontPageMagazine.com, September 28, 1999, http://www.frontpagemag.com/articles/Printable.asp?ID2658. (44) “First Americans were Australian”, BBC NEWS, (26 August, 1999), http://news.bbc.co.uk/1/hi/sci/tech/430944.stm. (45) Victor Englebert, “The End of the Uros”, The World and I Online Magazine”, 2001, http://www.worldandi.com/public/2001/may/uros.html. (53) Nigel Parbury, Survival (Sydney, Australia: Ministry of Aboriginal Affairs, 1991), 61. (56) Lowell Ponte, “Politically Incorrect Genocide, Part One”, FrontPageMagazine.com, September 28, 1999, http://www.frontpagemag.com/articles/Printable.asp?ID2658. (57) “Australia’s ‘First Americans”, The Daily Telegraph, 3(N). (58) Hermann Klaatsch, The Evolution and Progress of Mankind, ed. Adolf Heilborn and Joseph McCabe (Translator) (New York: Frederick A. Stokes Company Publishers, 1923). 286. (59) Jim Vieira and Hugh Newman, 2015. “Giants on Record: Hidden History of the Americas, “Nexus“, Feb-March, Vol 23, No. 2: 55. (60) Allan C. Wilson and Rebecca L. Cann, “The Recent African Genesis of Humans: Genetic Studies Reveal That an African Woman of 200,000 Years Ago Was Our Common Ancestor,” Scientific American 266, no. 4 (April 1992): 68. (67) Robert Lawlor. Voices of the First Day: Awakening in the Aboriginal Dreamtime. Rochester, Vt.: Inner Traditions International, Ltd. 1991, 26. I note in your essay/article that you make mention that much of the dissemination of original people was around the Pacific rim, finding evidence in artifact, culture and bone etc. From Papua, Malaysia, Japan to the southern tips of South America, which path would surely include North America too, wouldn’t it? A man by the name of Walter Plecker, Virginia’s first Registrar of the ‘Bureau of Vital Statistics’ drafted the ‘Racial Integrity Act of 1924’ which would then only recognise two races as “citizens” under US jurisdiction (not ‘Reservations’), white or coloured, in his desire to prevent miscegenation and stop ‘Coloured’ people from passing themselves off as white. Despite the many, many black Indians native to land, declaring they were indeed such natives and, had retained their cultural practices there for centuries, Plecker ordered state agencies to reclassify them as “Coloured” even while there were still many church records identifying them as native Indians… He also ordered the reclassification of entire families he chose by surname, claiming they were just trying to evade segregation. In 1913, he ordered the destruction of the first U.S. Census of 1790 records, which detailed the various tribes and ethnicities of black American Indians… in what turned out to be the great paper genocide of [black] American Indians. In 1988, the new politically correct term of ‘AFRICAN American’ was pushed by only 5 prominent people in America before it was legislated, including Jesse Jackson, as the new label to carry through society and state educational institutions, despite the opposition of the older community of black American Indians. I am wondering if you guys are aware of the growing realisation amongst many black [Northern] Americans, who have now discovered that the impossibility of the “Trans-Atlantic” Slave-Trade is a recent hoax, which has been imposed on their people at the outset of the establishment of the NAACP by very powerful Jews, for many political purposes; to indoctrinate black indigenous Americans that they are not living on their inherited land, (search: ‘African Americans Aint African’), to defraud them out of their inheritence and shame white people with this purported inherited crime – divide and conquer. There is much evidence to this, even just basic photographs from around the turn of last century, identifying many black Indians, even with original features. Given such, it is of interest, now that modern genetic studies are available, whether any such studies have been conducted among black indigenous Americans? Or whether no one would even consider the idea as they believe that the Asian Indians (‘Pale Face’) are the only such natives and black Americans now believe they’re all from Africa? Hi, I am not a Mormon, but your sealed up boat reminded me of a story in the Book of Mormon. I don’t know the chapter, but there is a part where God tells some people to make a ‘boat’, that really just sounds like a big box. So he tells them to make it, and then get inside and seal up all the cracks, and he will send it along to America I think. Seemed similar to the description of the Mayans floating to Australia. * How could your Origine’s results contribute to an existing Homos’ world order and a future way[s] forward? ** Can moiety & [physical] culture diversities coalesce and contribute (from within the individuals & the collectives) for humanity? *** Koala X Orca by 5% mtDNA diversity = ?’DBCFCR’ . . . ideal partnership? i will not rest until you guys start incorporating- Zealandia -Aotearoa- New Zealand-into your equations -is there a problem with my research ? Read with joy and taken in with deepest pleasure, Stephen and Evan.